Pet Travel Book Club: Exit Atticus, Enter Pete | Will My Dog Hate Me? It’s windy and cold outside and I’m lying in bed with Atticus, who is pressed up against me. Winter feels like it’s arrived! And most important I’m smiling. I’m smiling because of this wonderful blog post I’ve linked to regarding our story. The author, Rebecca Boren, gets that one of the main characters in the book are the White Mountains themselves. And it’s a great review to boot. I think you’ll enjoy it as it’s wonderfully written. As always, be kind to the bloggers out there. When you read their posts, remember, they love comments (if you feel so inclined). Nothing makes a blogger happier than a long list of comments! With the help of Randomizer.org, the signed book went to Patti P., who was so excited to win that she bought a copy of Am I Boring My Dog. Talk about a win-win for me! Kathleen Downey won the unsigned book, but as she already owned a copy with the author’s inscription, she generously donated the prize to another commenter. Using my judgement — and maybe a little nepotism, since we’re virtual friends — I passed it along to the one commenter on my site who said she hadn’t read the book yet but wanted to: A.J., creator of I Still Want More Puppies, who also supplied some questions for Tom Ryan. That’s right, in case you were worried, we’re not really saying good-bye to Tom, just taking a break before I interview him for an Animal Cafe podcast, which I will also post on this site. Please, let me know in the comments section, below: What would you like to ask about the book, Tom, Atticus… ? When you interview Tom, I’d be interested to hear more about his different relationships with Max and Atticus, particularly how he thinks having Max either prepared or didn’t prepare him for his very active life with Atticus. He obviously fell in love with the breed after Max – so was he surprised by differences between the two pups or did he notice a lot of similarities? (See, she earned her book). And heed what Tom said: Nothing makes a blogger happier than a long list of comments! If you read Tom’s blog, The Adventures of Tom & Atticus, you’ll see a “My Nightstand has These Books on It” section. And one of the books on Tom’s nightstand is Dog Walks Man by John Zeaman. Okay, that’s just a coincidence. I got John’s book a long time before I’d ever heard of Following Atticus. But it’s a nice endorsement, in case you need one. BTW, I just loved John Zeaman’s book. It was so beautifully written and I kept wanting to share it with someone. I read passages aloud to my husband. And I was thrilled to learn the Meadowlands is as magical a place as I always thought it was passing over it on my way to NYC. I hope it’s on your list to review. Your wish is my command, Pamela. In case you haven’t guessed: Pete is the name of the dog who walks the author and he is, like Charley in Steinbeck’s Travels With…, a standard poodle. I don’t believe that Pete himself is pictured on the cover of the paperback version of the book, above, but you get the idea. And have I got a deal for you: A chance to purchase signed copies of the paperback and the hardcover editions of Dog Walks Man at a discount, including shipping charges. To order these signed, discounted copies directly from the publisher, contact Amy Alexander at 203.458.4541 or e-mail Amy.Alexander at globepequot.com. Signed hardcovers are $20, signed paperbacks are $15, and prices include tax and shipping. 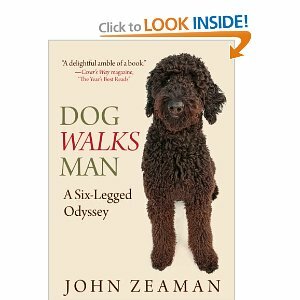 And of course there’s Kindle edition, but no signing will be involved: Dog Walks Man by John Zeaman. 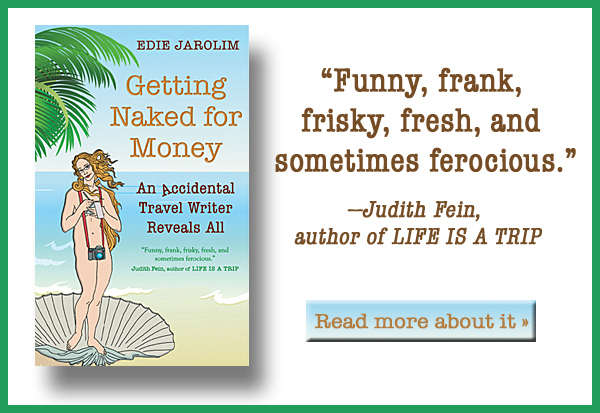 We’ll be discussing the book here and on A Traveler’s Library on Thursday, January 5. It’s tough enough for me to keep track of the books I’m going to be reviewing and the dates I’m going to be reviewing them; how can I expect others to remember? Inspired in part by proto-book club member and guest WMDHM blogger Jessica Rae of YouDidWhatWithYourWeiner?, who asked if there was a way to join, I am herewith vowing to create a badge and a newsletter. Any badge makers out there with ideas for a design? Send them to me along with a bid for what you’d charge (writestf at mac dot com). Hey, designers — and writers — shouldn’t work for free. Even the ones who blog. Category : Pet Travel	A Traveler's Library, Dog Walks Man, Following Atticus, I Still Want More Puppies, pet travel book club, pet travel book club badge bids welcomed, Something Wagging This Way Comes, You Did What With Your Weiner? Great! We can’t wait to see the badge. We will definitely post it on our site! The newsletter will be a good reminder too 🙂 I am intrigued by the book Dog Walks Man so I will stay tuned for your review. I just emailed Amy to order a copy of Dog Walks Man. Looking forward to the Animal Cafe interview with Tom as well. This whole book club has been such a great idea of you Edie. And John Zeaman’s book just arrived from Amazon Germany, so we are ready for some reading during the holidays. Thats was quite a recommendation from Pamela, looking forward to get started. How do you actually select the books, did you read them yourself beforehand? PS. Great idea with a badge, we will have it on our site! Thanks, Leo. And, yes, I do read the books in advance, or at least start reading them to make sure I enjoy them. Life is too short to take a chance on recommending books that I and others may not enjoy. Besides, I’m hoping to invite lots of authors to participate, so I want them to feel welcome! I was lucky enough to be sent review copies of both Following Atticus and Dog Walks Man; I’ve wanted to review Dog Walks Man for ages, so I’m glad I found a reason to commit to doing the review. I know it’s obvious, but I would like to know how becoming a best-seller is changing Tom and Atticus’s life together? Is there pressure to change (like to travel more) you are resisting? I know many people have been inspired by Following and would like to get back to the real world themselves. How can they set about doing it? What books would you recommend? You were biased against miniature schnauzers as “little yappers”. What surprised you about the breed? You faced major health challenges in the book — how are you doing? And how is Atticus? Do you think Atticus enjoys your road trips? Is your facobook page ever going to show Paige’s face? And of course, what’s your next quest? I’m so sorry I’ve missed the kick off of your book club Edie. This one looks wonderful. Gonna have to go add it to my Christmas list. I’d love to join and add the badge. Great idea. No worries, Mel — you’ve been busy this month, to say the least! I’m very glad you’ll be joining us. Now all I have to do is get a badge made….